Origin: Cichlasoma salvini (Salvinis Cichlid) are found in southern Mexico, Guatemala and Belize. Aquarium setup: Cichlasoma salvini (Salvinis Cichlid) should be kept in large aquarium with plenty of hiding places among roots and rocks, some fishes but not all leave plants unharmed. Floating plants are appreciated. 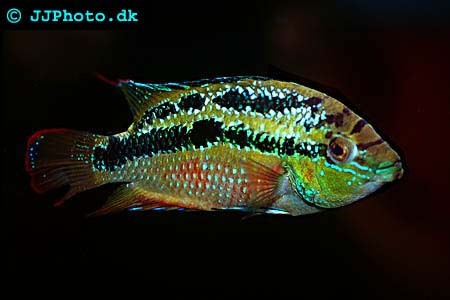 Feeding: Cichlasoma salvini (Salvinis Cichlid) accepts all types of food. 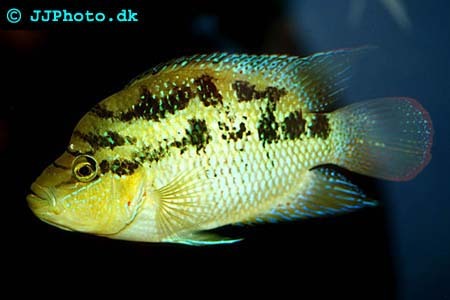 Breeding: Cichlasoma salvini (Salvinis Cichlid) can be breed in aquarium. They lay their eggs on a flat substrate; usually a rock and the parents guard the eggs and fry. The male is primarily guarding the territory while the female guards the eggs.